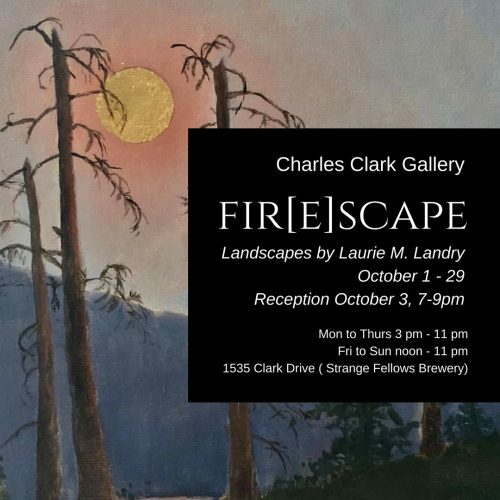 This month in the Charles Clark Gallery, we have a series of landscape paintings by artist Laurie M. Landry – beautiful yet chilling reminders of the vulnerability of our environment. Every year, I travel to document landscapes far and near. In January, I visited Iceland, and fell in love with the land formed by fire and ice, and the winter light. With photos I’ve taken and memories, I try to capture the colour and light of the Iceland. I also visit the Cariboo annually, and this past June was no exception. Instead of bucolic visions of northern Cariboo’s Boreal rainforest, I experienced the surreal world of smoke, fire, evacuation alerts and orders. I worried about family and friends who were caught in the evacuations. I watched endless news clips of fire and destruction. I heard first-hand recounts of evacuations and driving through walls of fire. I’ve experienced difficulty breathing due to the thick smoke.